She's been in the military since she left high school. Now she trains modern soldiers about the law in a lawless land. War is far larger and more complicated than what happens on the battlefield. Those who are working behind the scenes are often just as important to success as the soldiers kicking in doors. The rules of war have changed in the 21st Century, and people must be in position to administer the law. 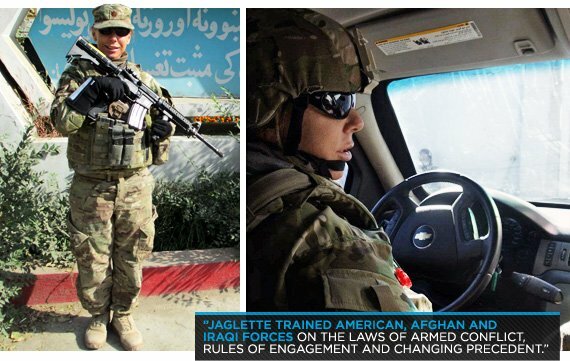 Jaglette trained soldiers in Iraq on law as it pertains to wartime activities. She trained American, Afghan and Iraqi forces on the laws of armed conflict, rules of engagement and changing precedent. She has been stationed in some of the most dangerous places on Earth. She is proof that survival belongs to the fittest. As a tomboy growing up, fitness was always a lifestyle for me. I ran track, played basketball, softball, volleyball, surfed, golfed, bowled, ran 10Ks, triathlons and adventure races. I started tossing iron in high school and immediately liked the benefit of strength. Weightlifting soon became a necessity of functionality for me. My sport of choice, my passion, is surfing. I discovered that strength training made me a better surfer, allowed me to paddle my longboards into bigger waves, gave me the endurance to stay in the water for two-plus hours and of course survive major wipeouts! When I did tours overseas with no access to surf, strength training allowed me to immediately jump back into the water without having a two-week break-in period to "get my arms back." The benefits rolled over into all my physical activities. Without dedicated training to one specific athletic event, as long as I was lifting, I would never win the event or game, but I'd still do well, and complete the activity with no injuries or soreness. Weights were also my solution to preparing for deployments. Wearing between 40-65 pounds of additional weight while climbing in and out of MRAPs/helos and conducting foot patrols required mega conditioning and strength! My body would have been wrecked had it not been for strength training. It wasn't until I met a group of sailors (Project J) on my second tour in Bahrain that I was made aware of how I could completely transform my body and still maintain a high level of functionality and fitness through nutrition. I learned how to properly fuel my body and not just feed my emotions. New eating habits tied into new training routines changed me both physically and mentally. As a result, I entered my first figure competition and found the adrenaline rush to be almost comparable to surfing big waves. Since 2009, bodybuilding has become a new passion and a part of my daily life—not just a necessity for performing my duties and surfing. An additional benefit: I swear it is the fountain of youth! I consistently preach to whoever will listen that lifting heavy weights will keep you looking and feeling young! It wasn't a difficult transition for me. I joined the Navy immediately after high school. However, I'm sure the transition from military to civilian life will be challenging! I am currently deployed in Afghanistan as an advisor to the Afghan National Security Forces in support of the NATO mission. My duties consist of advising the Afghan Security Forces in my area of operation, which requires donning full kit (body armor that is loaded down with my M-4 and M-9, accompanying magazines, blow-out kit, fighting knife, and bottle opener) and navigating the wild west of Afghanistan's traffic to engage and mentor various Afghan officers at their respective compounds. I'm typically "outside the wire" six days each week depending on the security posture. Working in a job where I interact daily with our Afghan partners is a unique and exhilarating experience. I know that when I depart that I have had a direct and positive impact on the rebuilding of this proud nation. How have your tours of duty changed the way you look at fitness? My first deployment was a wake-up call as to how important and necessary it was as a small female to be strong and have endurance. Not only was my life dependent upon it, but also those of the soldiers, sailors, marines, and airmen around me. I never wanted to be the female who could not carry her load. My fitness level ensured those around me that I was not the weak link and could be depended upon in a crisis. Fitness also became a stress reliever and paramount for my mental health! There is nothing a fast run or heavy lifting session cannot fix after a stressful day. Surfing professionally would have been my dream job, so I might have given it a shot. Otherwise, I would have pursued working for the U.S. government overseas. For me, it's been the constant transfers and deployment. It's difficult to have a pet or live plants given I am always on the go. But being on the go is also a quality that attracted me to the military lifestyle! It's enabled me to see the world and obtain friends on almost every continent! Please explain what it's like working with NATO, compared to other branches? NATO is fantastic in that I work with people from various countries. Learning about different cultures is great, and being part of one team gives me a surreal feeling of "one team one fight." It's amazing to look around me and hear six or seven conversations in various languages between people in different uniforms but know we all have the same mission. I learned quickly that although we are from different countries, for the most part we are all the same. Fitness is what keeps the personal sacrifice in check. When you feel good about yourself, you feel good about your job and those around you. Do you think it's more or less difficult for military women to stay in shape than it is for civilian women? In my opinion, there is no difference between the two. It all depends on the job. I have been in positions in which it was difficult to find the time to work out. Although the Navy gives you dedicated PT time, I would have to forfeit it in lieu of work. Then there are jobs that I had the time for a dedicated workout routine and diet. It's my impression from my civilian friends the same applies for them! I aspire to move on from the military to a job that allows me to train and diet properly and consistently. If this occurs, I would like to continue competing and challenging myself. It's amazing watching my body adjust to tweaks in diet or new exercises. Finally, one day I'd like to pursue a part-time career as a personal trainer, to help others interested in making a positive lifestyle change! How do you think bodybuilding helps you as a soldier? The strength definitely allows me to complete my missions without being tired, sore, or injured. As I have aged, it amazes me that I'm not suffering from painful joints or pulled muscles given all the sports and running I have done over the years. I attribute bodybuilding to keeping my physical health in good working order. Overall, bodybuilding has instilled confidence and kept me healthy. When I look good, I feel good, and this rolls over into my professional and personal life. Rachel McLish and Ava Cowan. Don't be intimidated. Get in the weight room today! 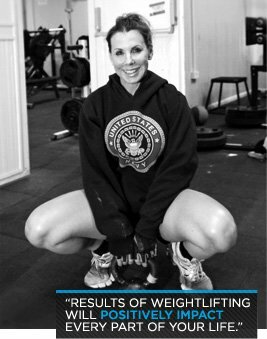 The results of weightlifting will positively impact every part of your life as well as those around you. Additionally, the people who you will meet in the gym and who pursue this lifestyle will become lifelong friends who will also have a positive effect on your life.